Sinclair is a family-owned, vertically-integrated oil company, involved in all aspects of our industry, from oil and gas exploration to motor fuel distribution. We have executive offices in Salt Lake City, Utah, two refineries in Wyoming, and over 1,400 branded Sinclair stations in 29 states. Sinclair relentlessly pursues a safe, reliable, environmentally responsible and a profitable operation, ensuring a sustainable future for our owners and employees and the communities where we operate. We’re American-owned and operated, we source the bulk of our supply from the United States, and we believe a successful business is one that benefits its community. We’re built on integrity and loyalty, treating our customers and co-workers the way we want to be treated – like family. We have a never-ending drive to make our facilities safer for our employees, the community and the environment. Our rigorous initiatives have earned both of our refineries Gold Awards for Achievement in Safety from the National Petrochemical and Refiners Association. Sinclair is over 100 years old, but we couldn’t have lasted this long if we didn’t stay ahead of the times. We combine old-fashioned values with tomorrow’s technology for cleaner, more powerful products. The experienced upstream team in the Sinclair Oil & Gas Company is focused on unconventional resources in basins throughout North America. Our expertise in evaluating source rock and reservoir characteristics and the drilling of horizontal wells with multistage fracture stimulation make us an ideal partner for projects large and small. We operate crude oil and natural gas wells in the Williston Basin, Mid-Continent, Permian Basin, East Texas, Michigan Basin and the Rocky Mountain region. Sinclair owns and operates two refineries in Wyoming. The combined capacity of the two plants exceeds 110,000 barrels per day, making Sinclair Oil Corporation the largest refiner in the greater Rocky Mountain region. The Sinclair Refinery is the larger of Sinclair's refining operations. It is the most sophisticated and complex refinery in the region, capable of processing a variety of crude oils, from heavy sour to light low sulfur crudes that are produced in Canada, North Dakota and Wyoming. The refinery produces high quality products including regular and premium gasoline, diesel fuel, jet fuel, propane, butane and road asphalt. The Casper Refinery is an economic cornerstone for central Wyoming. It primarily processes low sulfur crude produced in Wyoming and North Dakota. While it has been modernized several times, the Casper refinery originally opened in 1923, making it one of the oldest refineries in the Rocky Mountains. In addition to supplying our refineries, Sinclair Crude Company, formed in 2014, facilitates purchasing and transporting crude oil at the “lease” level. We currently acquire crude oil in Wyoming, North Dakota and Montana, but are quickly expanding into new markets. Sinclair owns and operates over 1,100 miles of pipelines to transport crude oil and refined transportation fuels. We operate five crude oil terminals with combined storage of more than 2 million barrels and eight light product terminals located in Idaho, Wyoming, Colorado, Kansas, Missouri and Iowa, with a storage capacity of 2.7 million barrels. Through joint ventures, Sinclair has a financial interest in an additional 700 miles of pipelines and three light product terminals. Sinclair safely operates a fleet of 70 transport trucks that move transportation fuels to customers, intermediate products for our refinery operations, and jet fuel to our military customers. Our professional drivers are consistently recognized for superior safety performance. Our iconic dinosaur is the symbol of one of the most recognized and longest continuously operated oil brands. Our supply chain network includes over 400 distributors and more than 1,400 Sinclair branded stations delivering gasoline and diesel fuel across 29 states from the Midwest to the West Coast. DINOCARE™, our TOP TIER™ gasoline, exceeds the highest quality standards for today’s most complex automotive engines, providing optimal fuel economy and reduced intake and combustion chamber deposits, for lower vehicle maintenance costs and engine emissions. We couldn't have lasted this long if we didn't stay ahead of the times. Sinclair has had a wild ride so far, but we’ve stayed the course – and we’re looking forward to the next leg of the journey. Perhaps the best thing that could’ve happened to 20-year-old Harry F. Sinclair was losing nearly everything he owned in a bad speculation – including the drug store his father had left him. Harry was a brilliant, stubborn, ambitious risk-taker, and a druggist’s life was far too tame for him. Harry set his sights on the oil business, starting small, selling lumber to oil derricks while buying and selling leases on the side. He had a nose for productive oil sites, and soon he was picking up support from wealthy investors. By age 31, Harry was the richest man in Kansas. In 1916, at age 40, he officially formed Sinclair Oil Corporation out of the assets of 11 small petroleum companies, and by the late ‘20s, it was the seventh largest oil company in the United States. Dinosaurs first appeared in Sinclair marketing in 1930 as part of a campaign to educate customers on the origin of fossil fuels. The Apatosaurus (then thought a brontosaurus) quickly surpassed the T-Rex and triceratops in popularity, and by 1932, we had registered Dino as a trademark. The dinosaurs appeared again as life-sized fiberglass models at the 1964 World’s Fair – and you can still see many of those models in state parks and museums across the country. 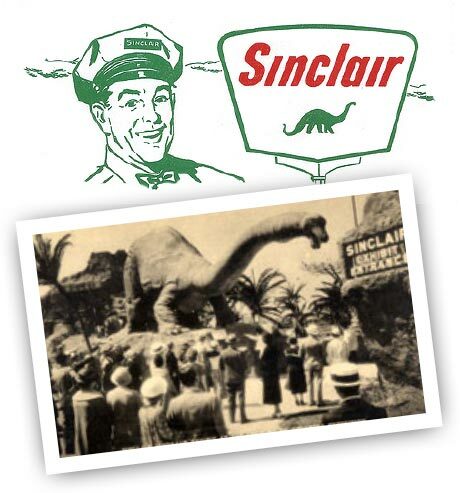 As a privately-held, family-owned company, Sinclair is now one of the oldest continuous brands in the oil business, and our dinosaur is one of the most recognized icons in Americana. Explore our interactive history section.